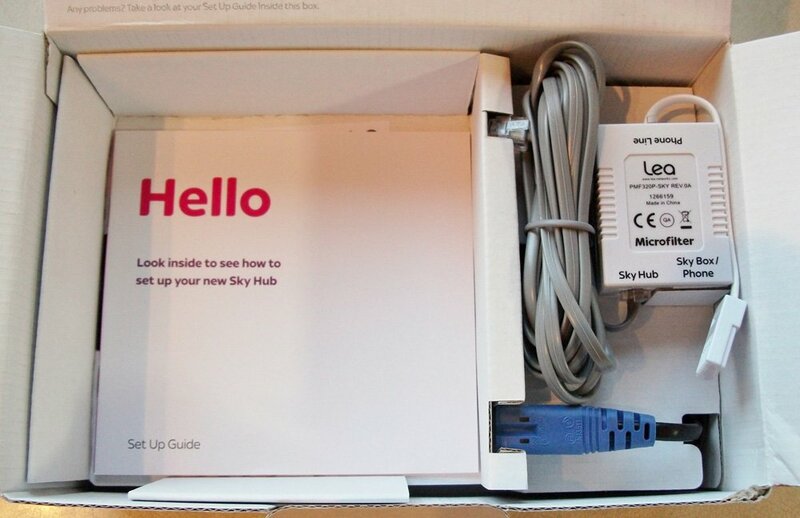 I have just switched my broadband over to sky (from BT) and here is a review of the new router that I received. I have been using it for a month now. 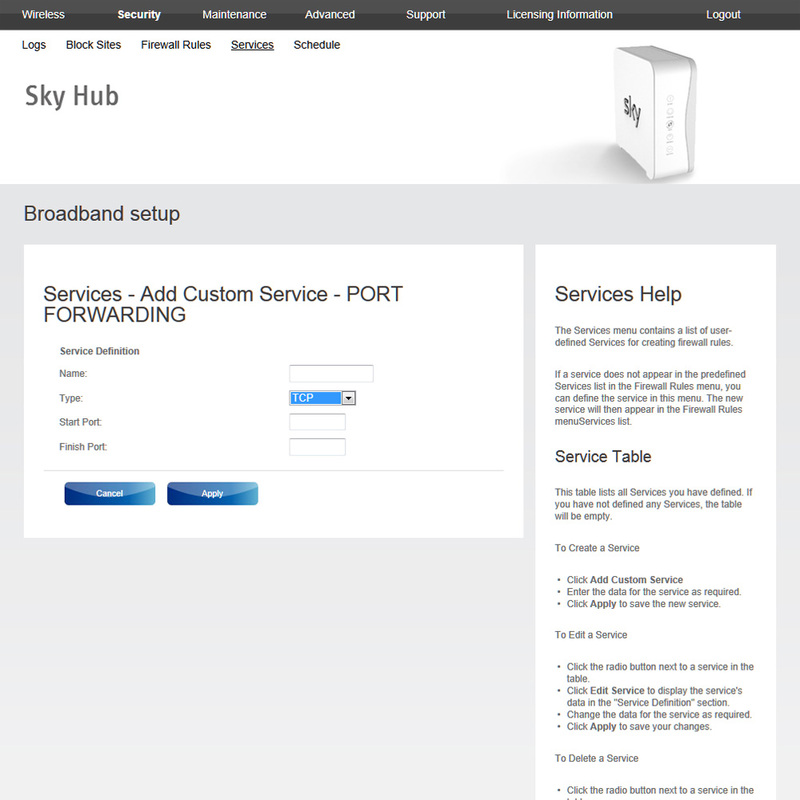 Sky have now streamlined the switchover from your current broadband supplier and there is no need to get PAC codes or for that matter contact your exist supplier at all! 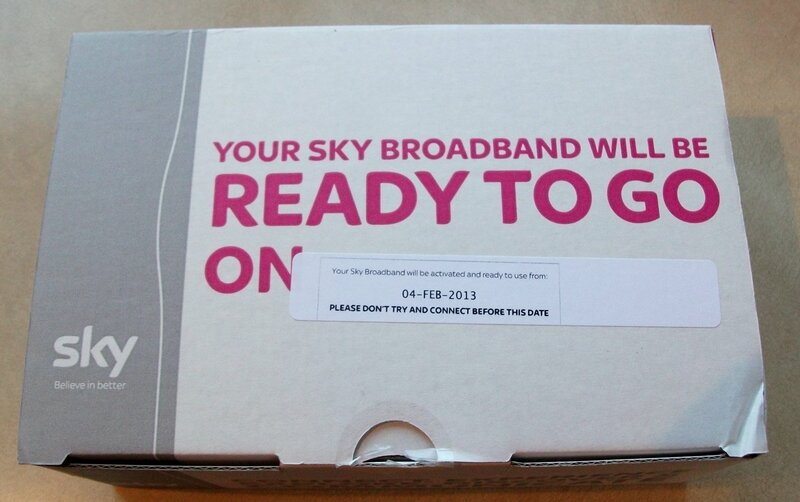 This was certainly the case with BT and seems to be the case with the other mainstream broadband suppliers. 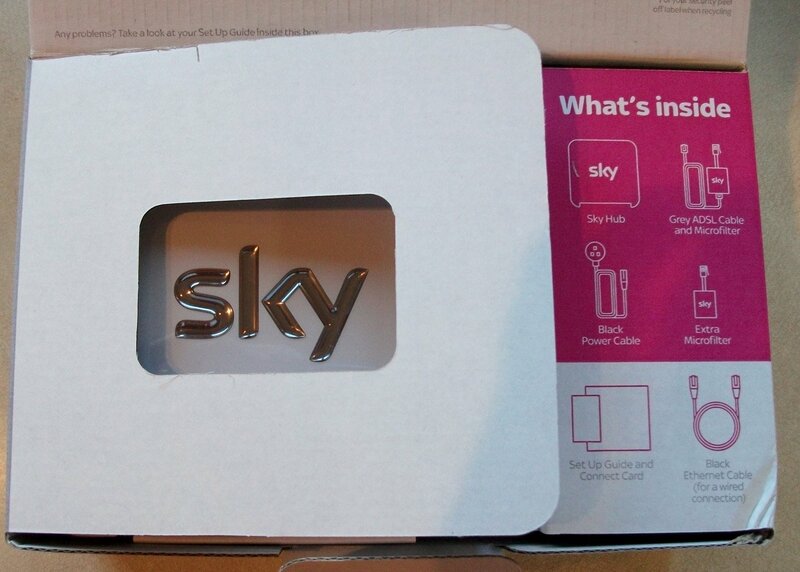 In my case it took two weeks from the date of application to the switchover happening, I think this is typical and is the time advised by Sky when you apply. 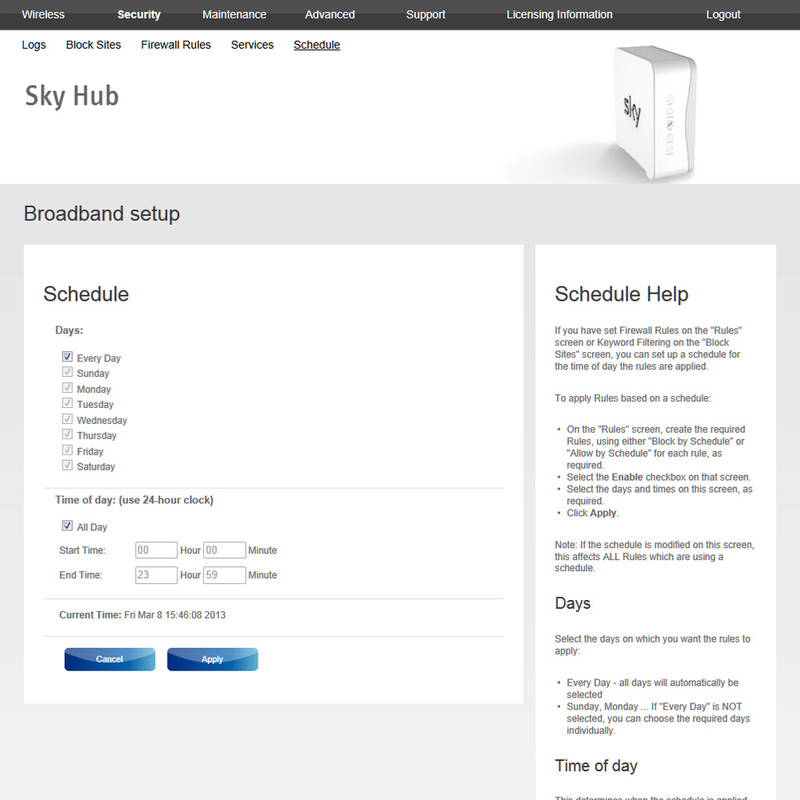 Sky keep you well informed of the progress of the switchover via email and let you know when the new router has been posted to you. It is supplied via recorded delivery so you will need to be in the house when it arrives or arrange for someone to sign for it. 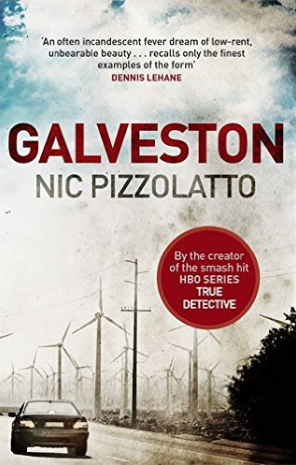 It will arrive a few days before the switchover date. 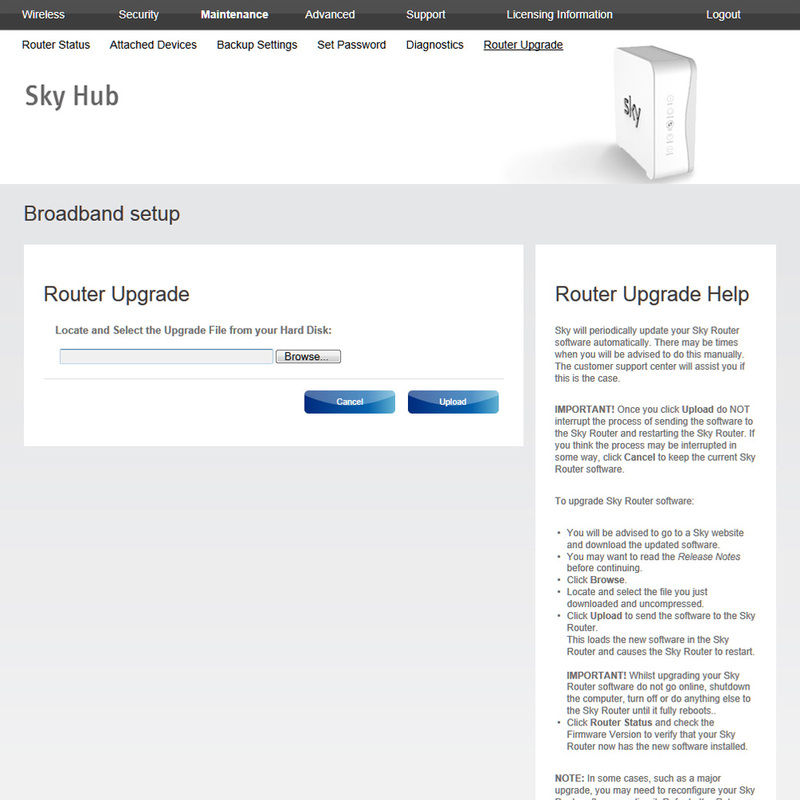 The router in question is the SR101 and Sky’s information on it can be seen here. 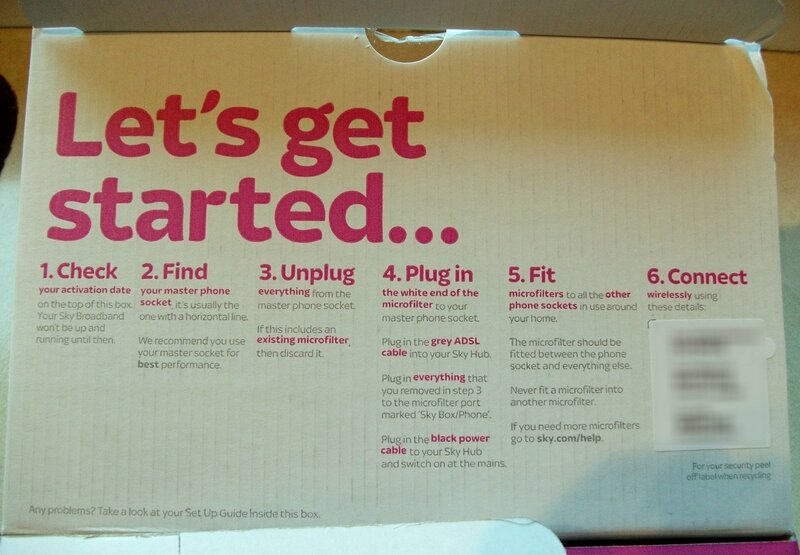 See the images below for more details on the router package, clicking on one will take you through a slide show of the unpacking sequence. 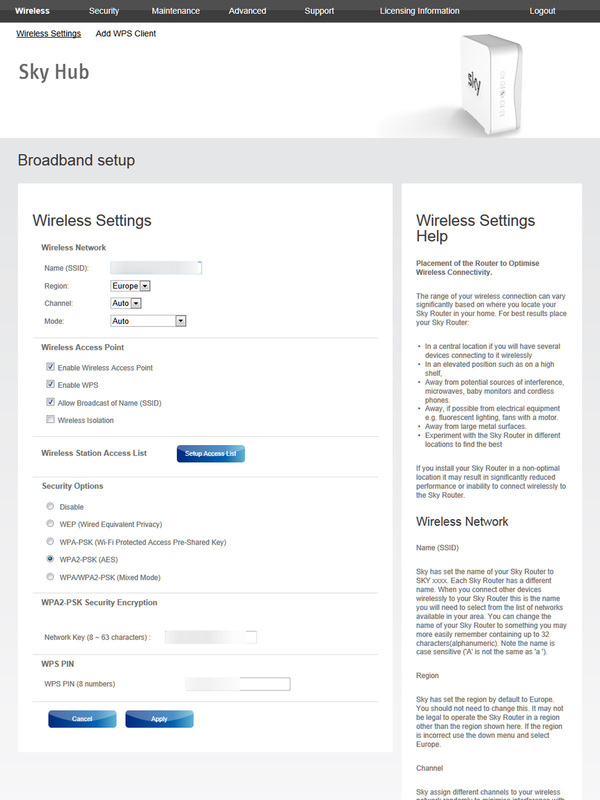 Wireless N router (works on 2.4GHz mode, 5GHz not supported) Also supports older formats like 802.11b and 802.11g. Two MIMO aerials to optimise the potential range of operation. Four Ethernet ports running at 100Mbit/Sec. Note these are not Gigabit Ethernet which tends to be the standard on PCs and Routers nowadays; these will not impair speed of data from the ADSL link (i.e. 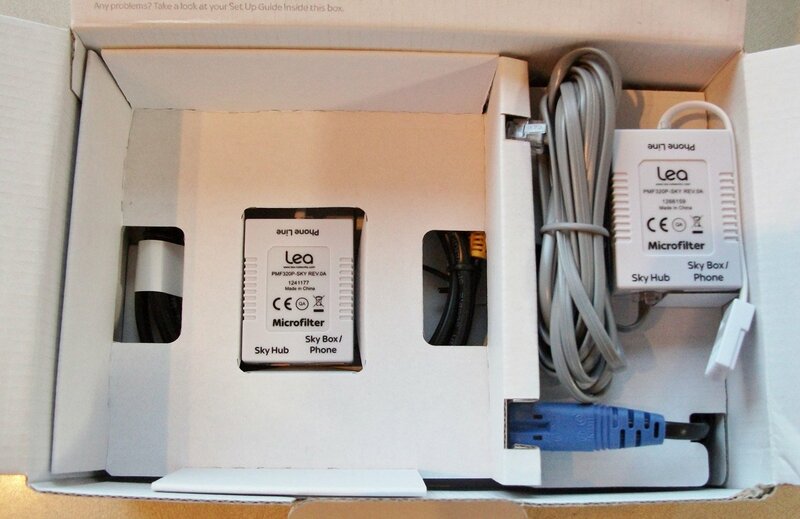 will not slow up internet connections), but for data transfer between PCs the slower port speed will make a difference. Mains powered, has an energy saving feature where the power consumption is reduced when not in use. WPA2 encryption (and WPA and WEP older formats if needed). Wireless can be disabled. 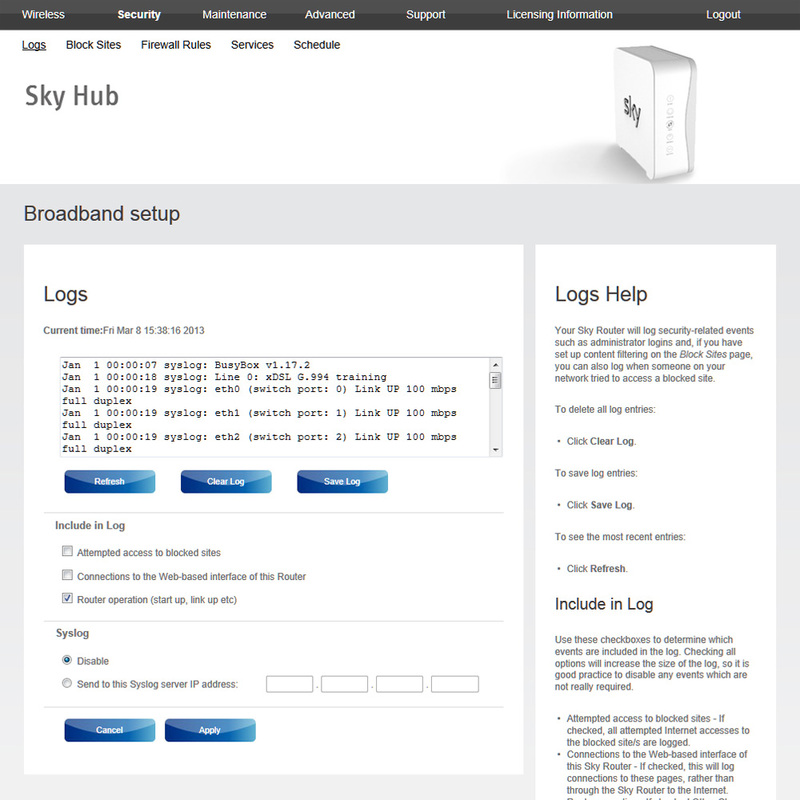 SSID name can be changed as required by the user, broadcasting of SSID can be disabled. The WPA2-PSK Network Key can be changed. 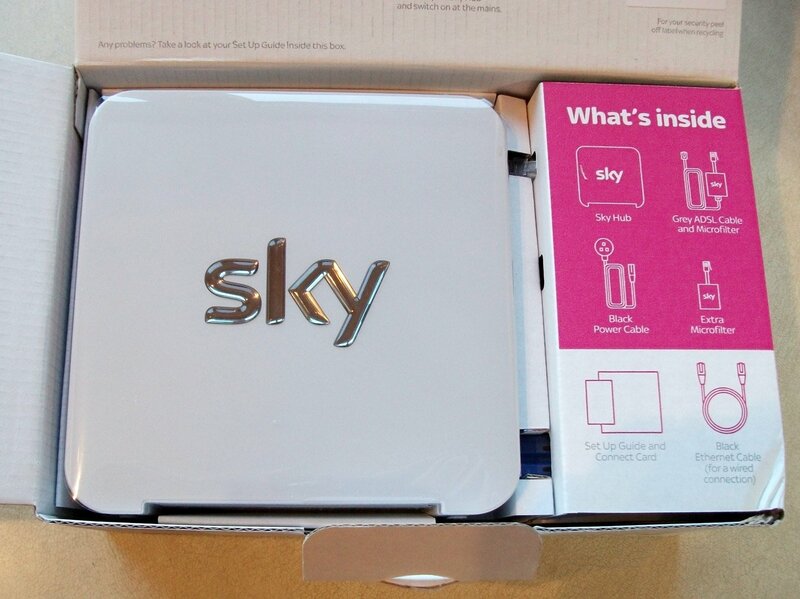 I would recommend that you do this as the supplied Sky one is only eight characters long and consists of only numbers and upper case letters so would be more vulnerable to hacking than a longer and more mixed case key that you could create yourself. 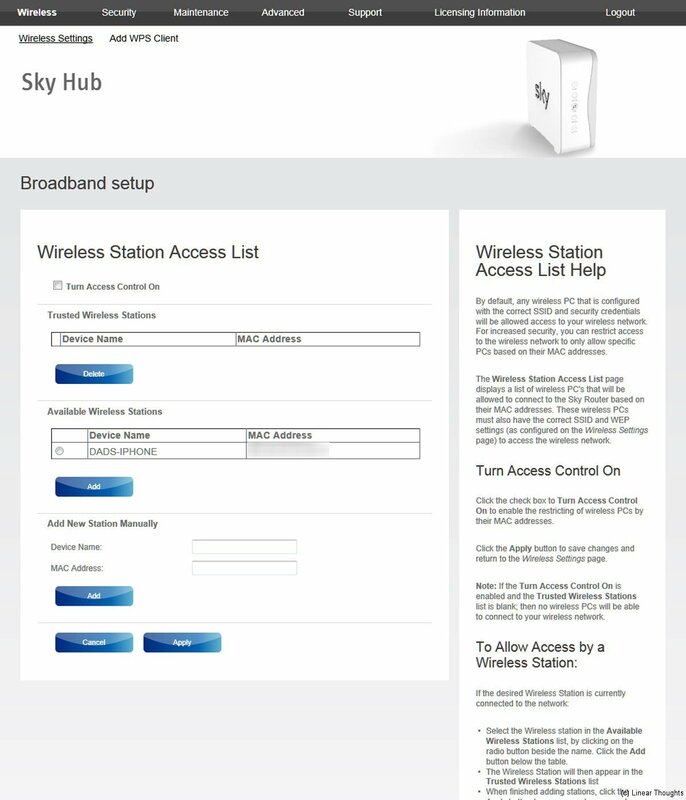 Wireless Access can be limited by MAC address. Keywords or domain names can be blocked, schedule can be set for these. 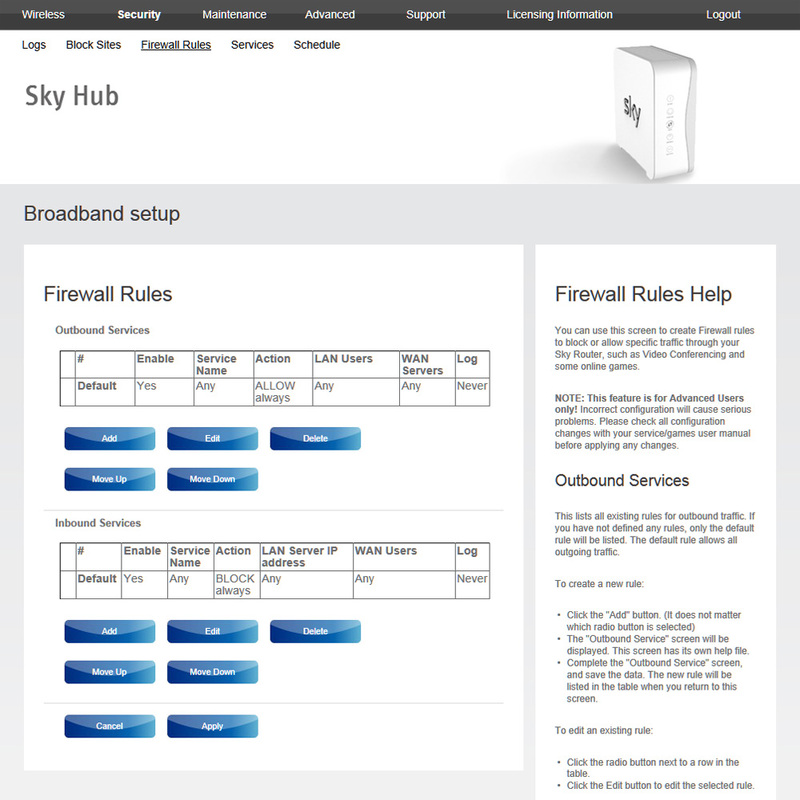 Firewall rules can be configured on a service by service basis for inbound and outbound services. Settings can be backed up to a .conf file. 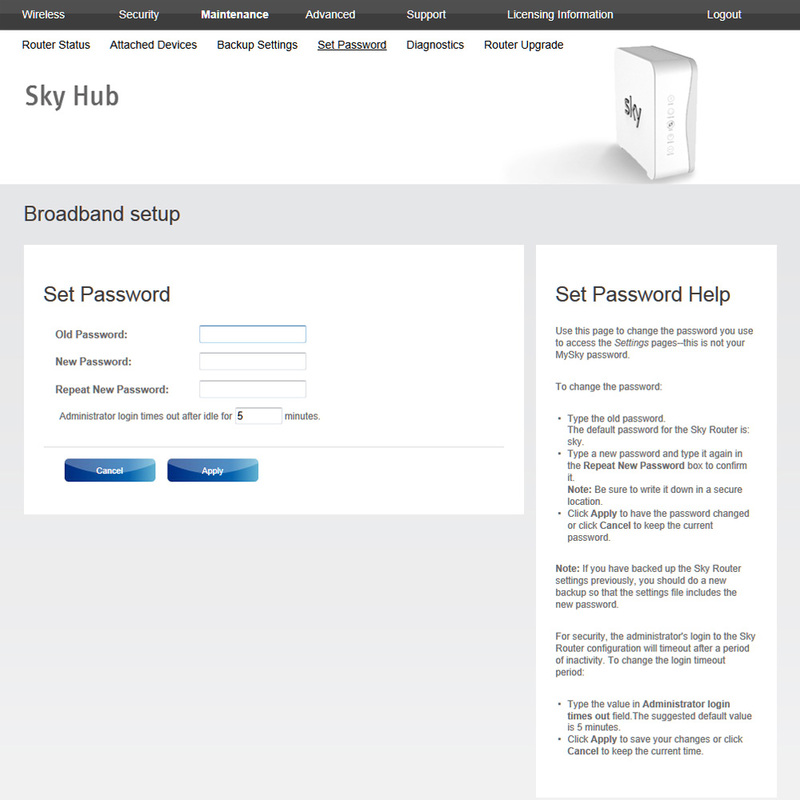 Default login password can be reconfigured. 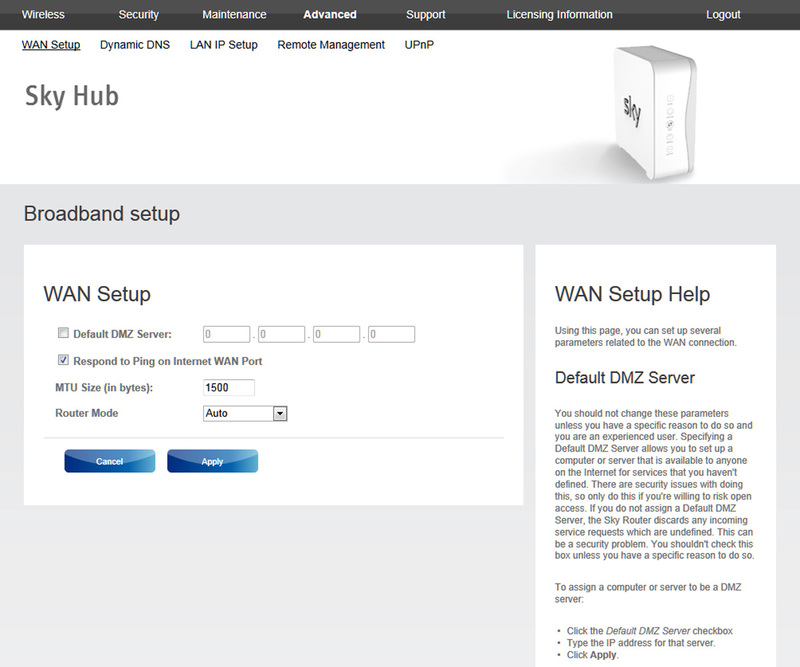 Default DMZ server can be configured. 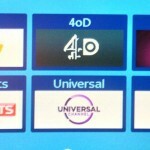 If you don’t know what that is then leave it well alone! 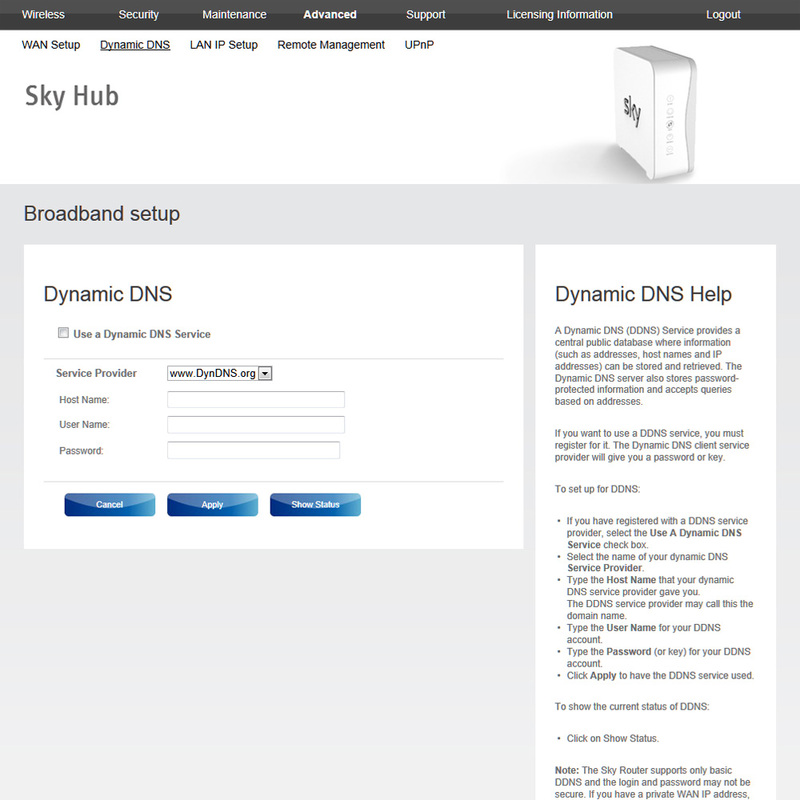 Dynamic DNS is supported (via www.DynDNS.org). 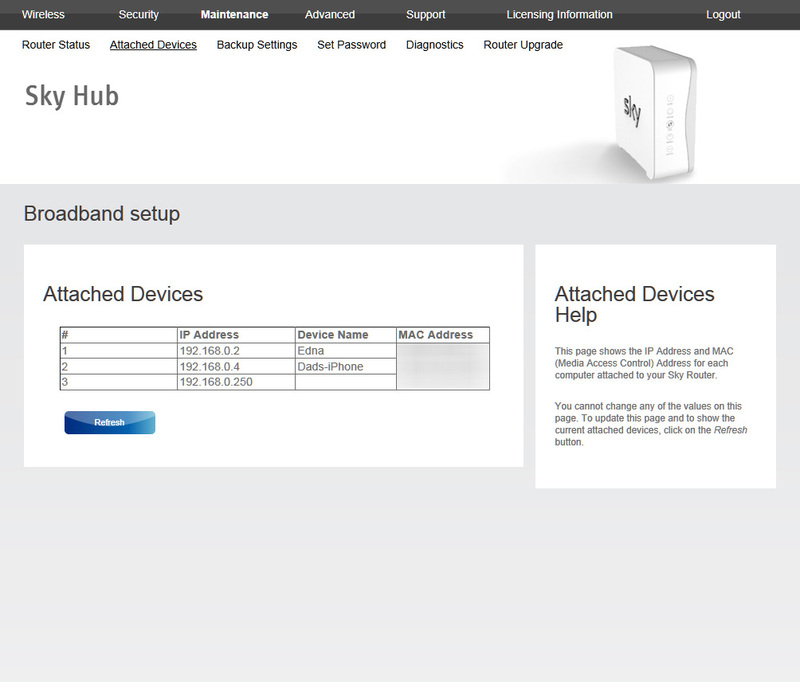 This can be used to let you log into your home network when working remotely, so that you can access webcams or PCs. 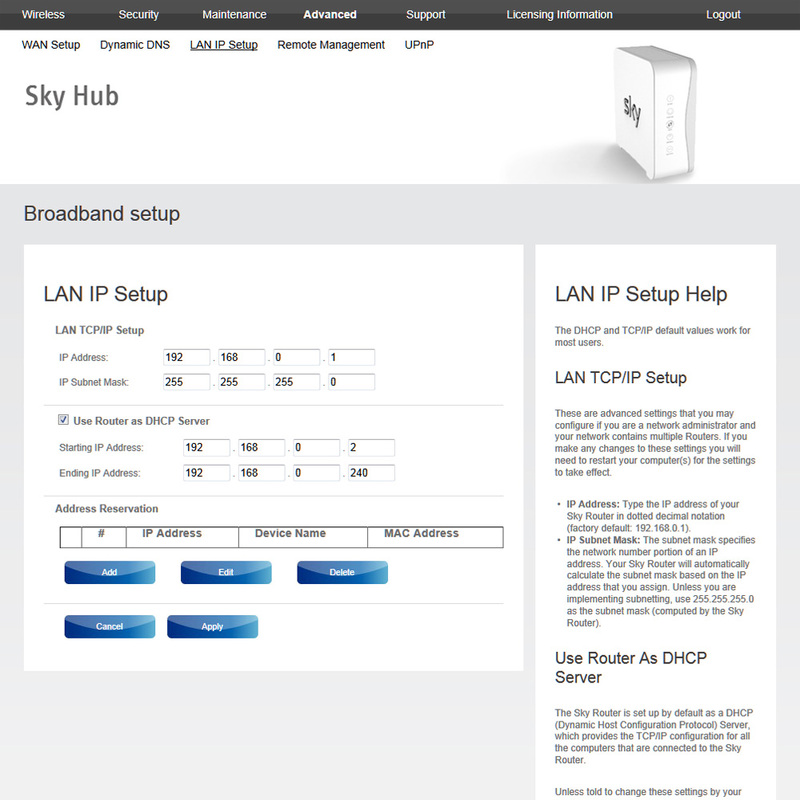 DHCP server address range can be configured. 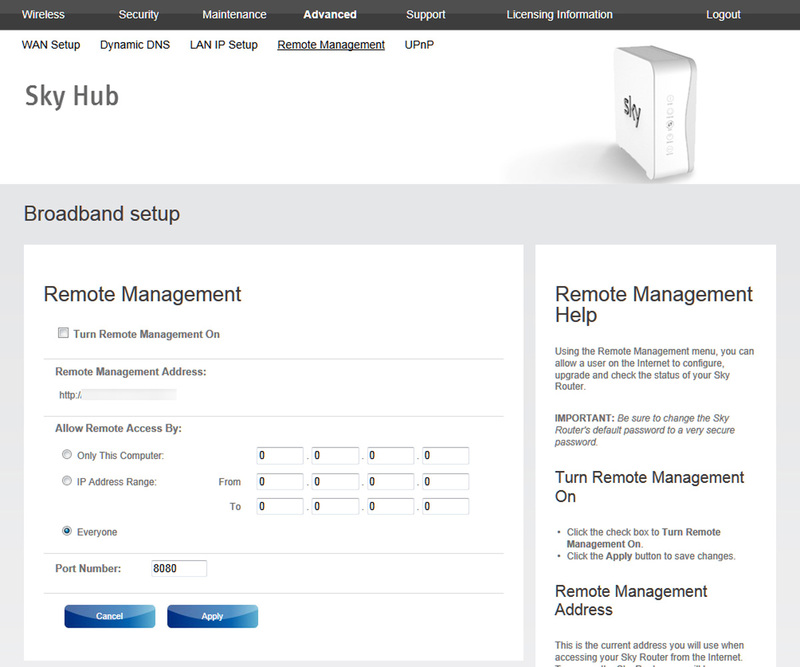 Remote management access can be configured. Uses MER (MAC encapsulated routing) to talk to the local telephone exchange. 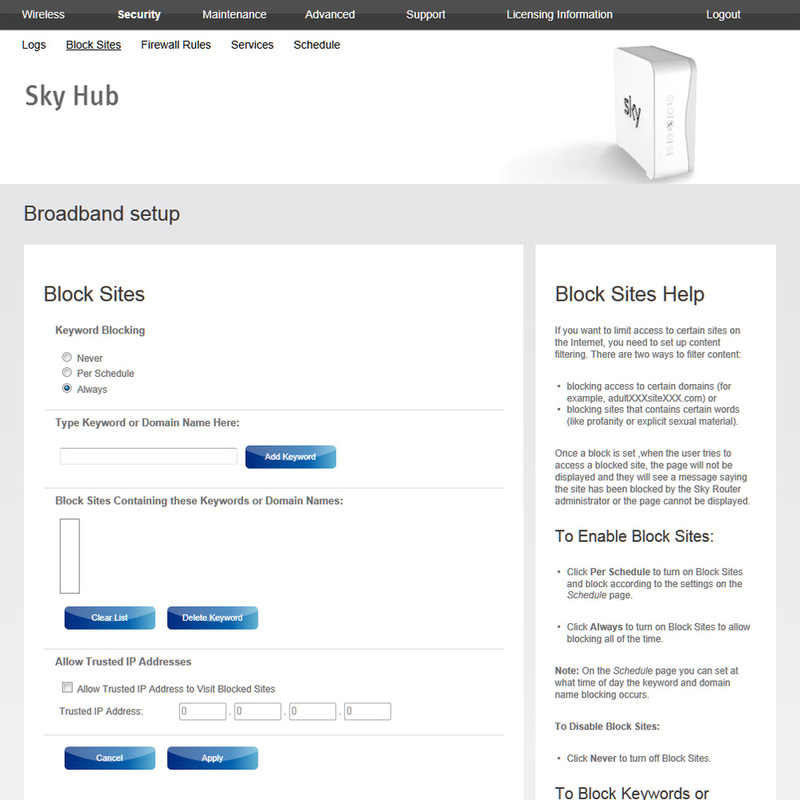 This avoids the use of having to provide your user login and password, instead it uses the MAC address on the router to establish who you are. 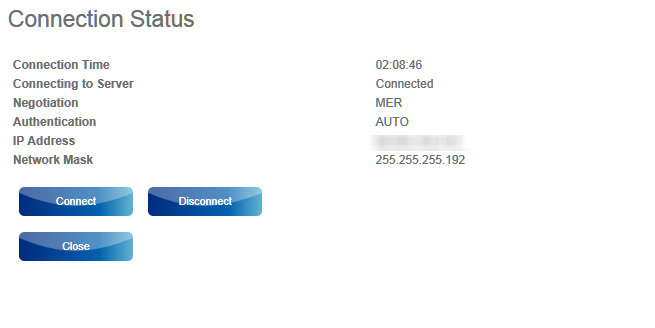 I am getting a fast (for ADSL) connection from my local exchange using this router. 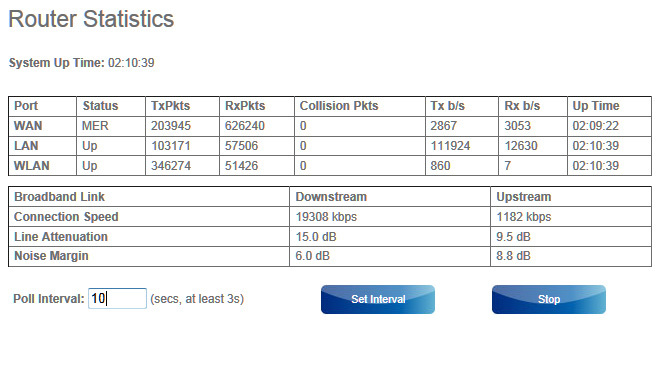 See the image below for details of the speed that the ADSL is running at, summary is downlink is running at 19Mbit/s. I should point out that I am fairly close to the exchange, I am no more that 500 metres away from it. 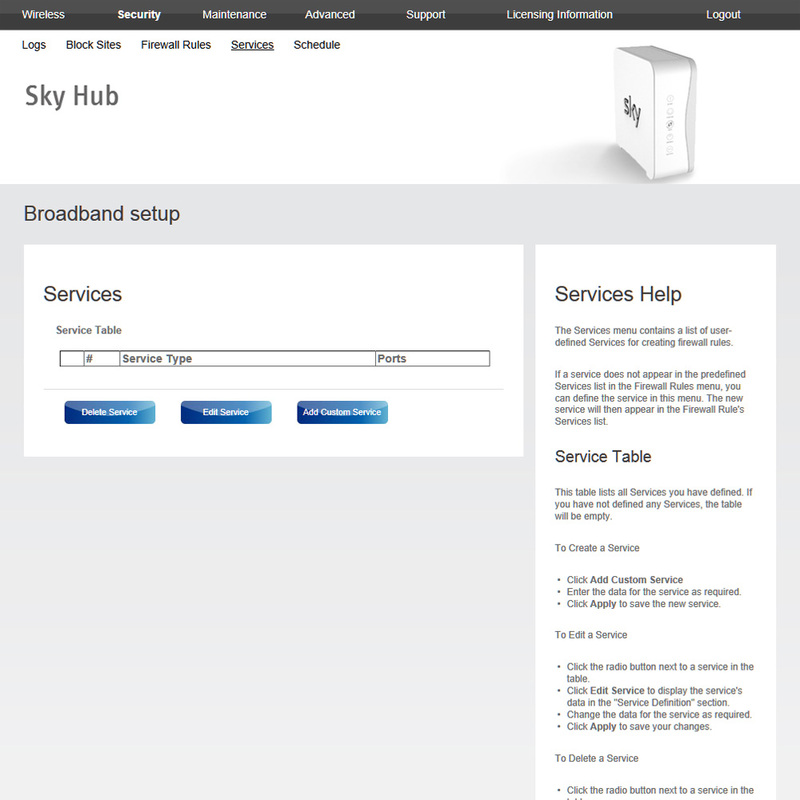 Sky provide a very competent router at an extremely competitive price (free for the first six months then £7.50/month after that when combined with a Sky TV subscription, 12 month contract). 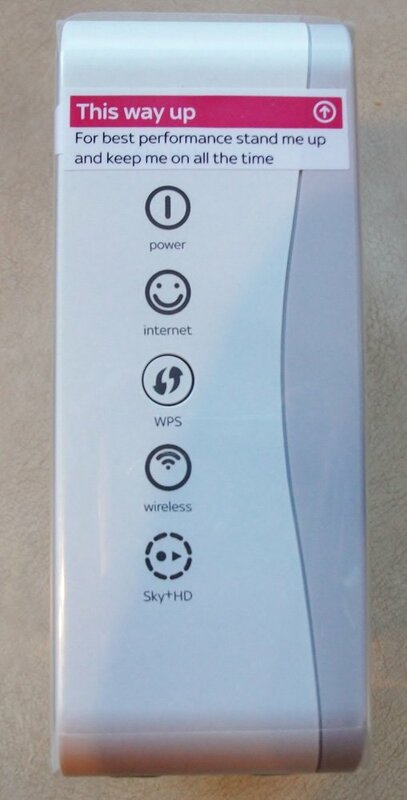 The router is very capable and provides all of the facilities that a home consumer would need in an attractive looking unit. 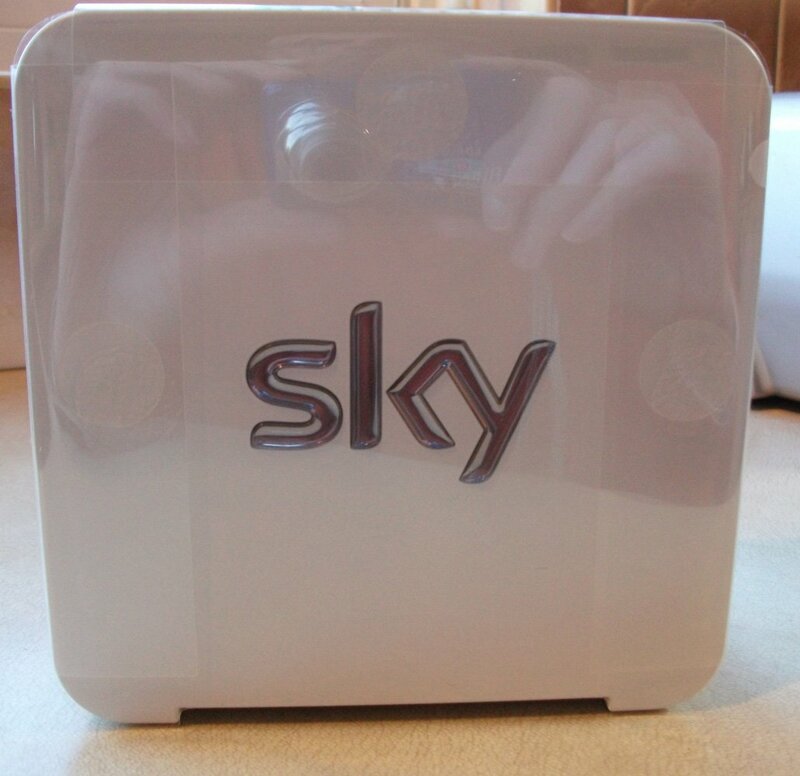 It integrates well with the sky HD+ box and supports movie streaming (Sky On Demand) through that unit. 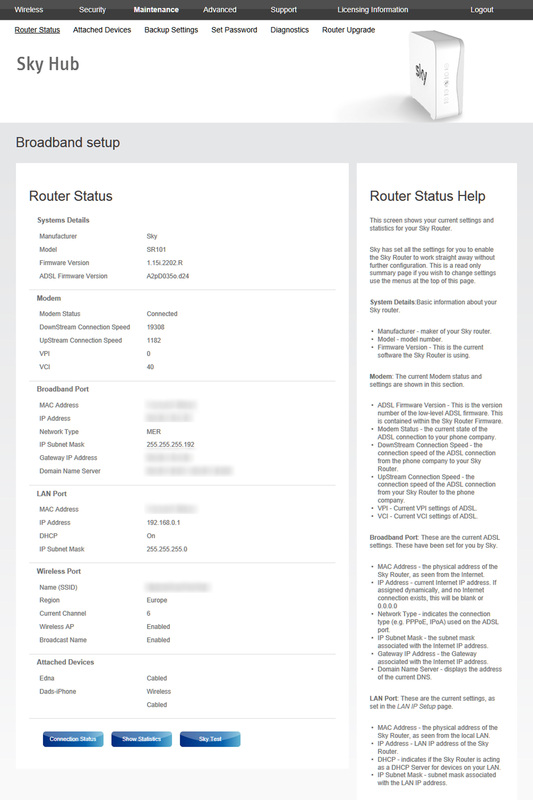 It appears extremely stable and has not had to be reset to date (over one month of operation) and portable devices like my iPhone always connect without problem, which was not the case with my previous NetGear router (DGN3500). Would have benefitted from Gigabit Ethernet lan ports. 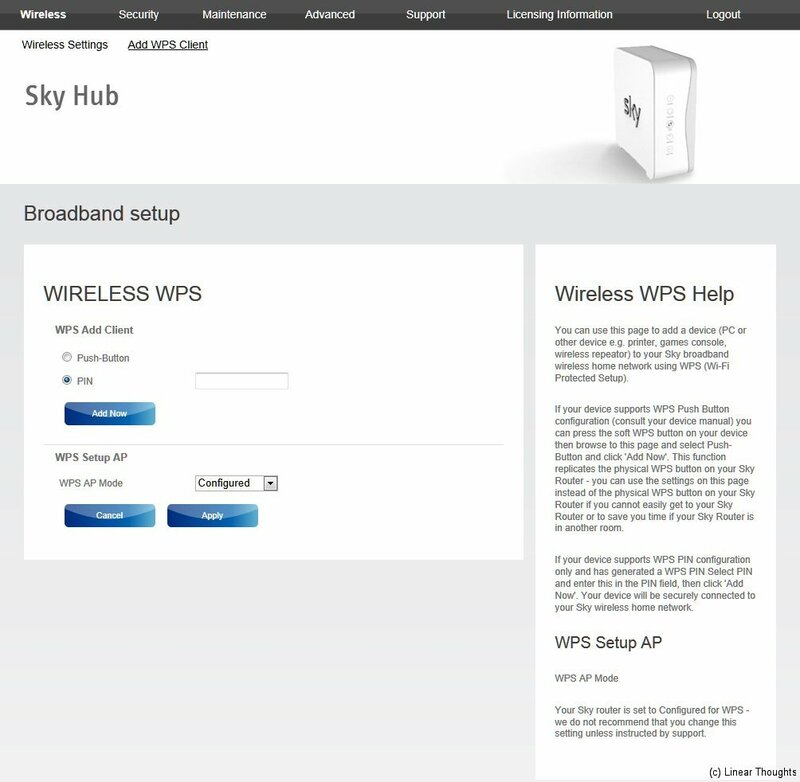 These pages deal with how your devices connect over wifi – they allow you to set up the name of your network (SSID) and how the wireless access point should be setup. 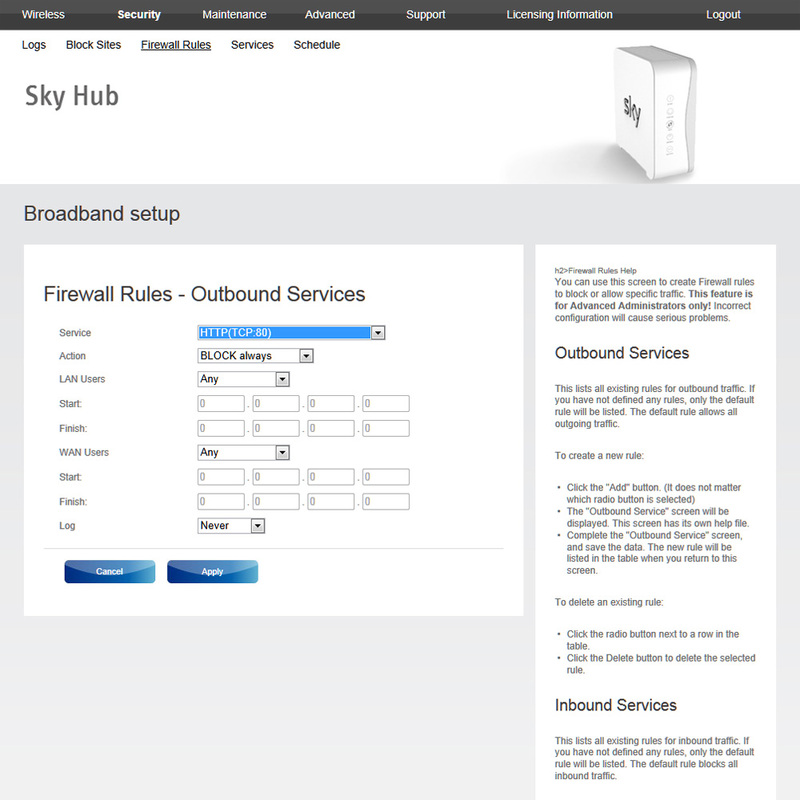 Also allow the network key to be setup although you can continue to use the Sky supplier key if you wish. These pages let you look at performance logs, block particular sites using keywords or domain names and set the times of day that will apply. Also let you set up firewall rules but these should only be done if you have a good understanding of what you are doing. 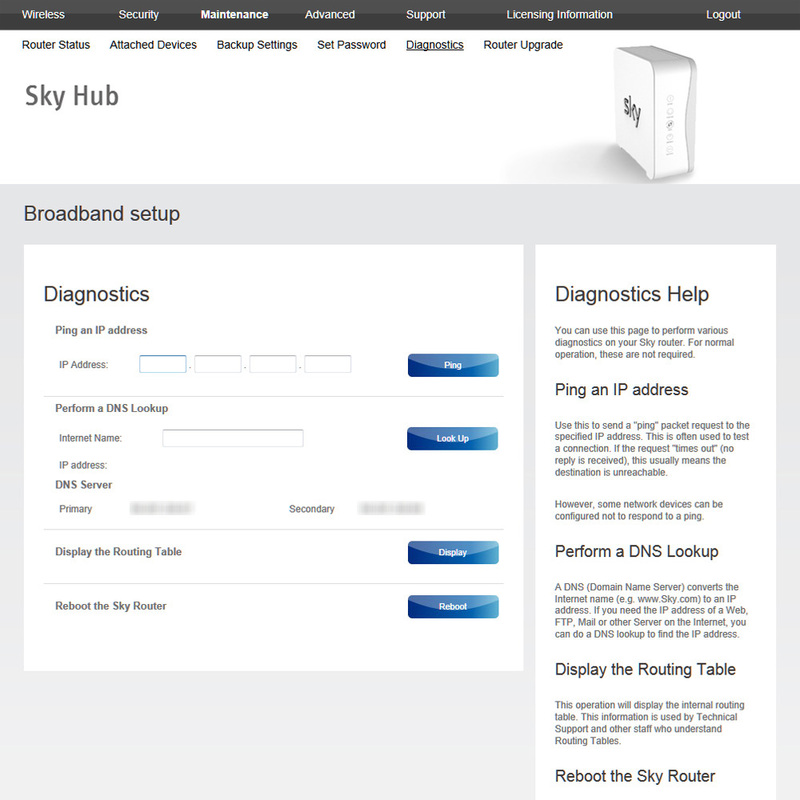 These pages provide detailed information on the status of your router, covering aspects like MAC addresses, connection status and attached devices. 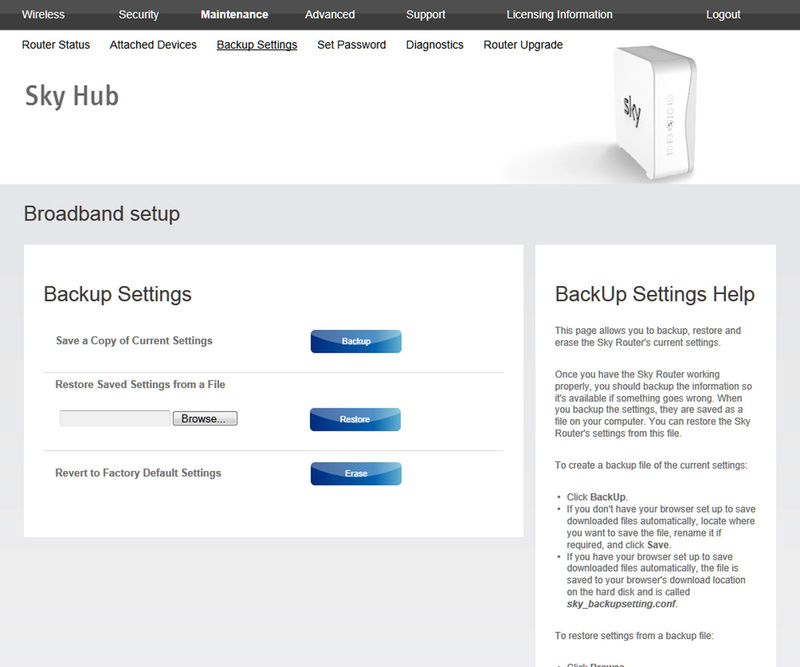 Also allow the settings to be backed up and the router upgraded. These pages deal with the more complex aspects you may want to setup on the router, covering things like setting up a DMZ server, setting up a Dynamic DNS server and the range of IP addresses to be used for DHCP. 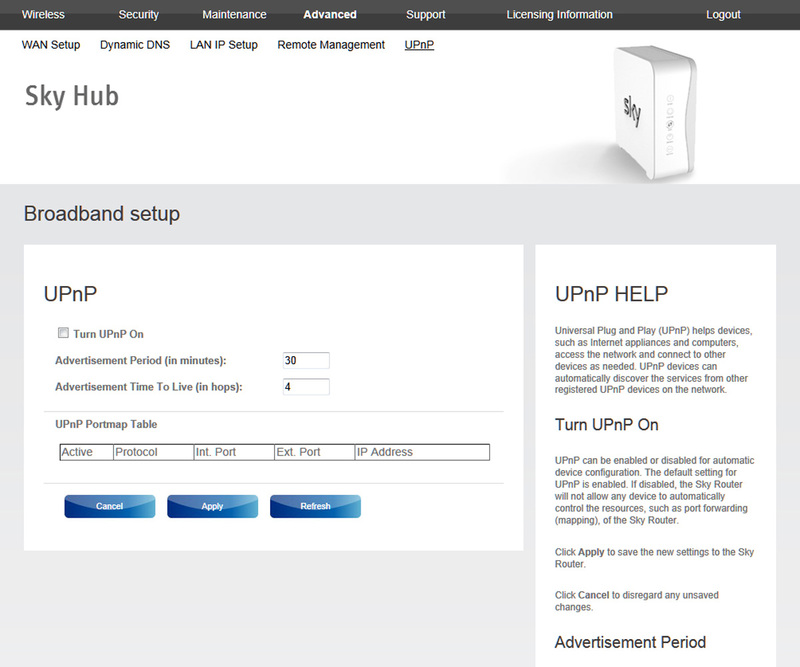 Note that the DHCP address range shown here is not the default range, see How To Fix Offline Printer Issues-Setting up a Static IP address for the reason that was changed.